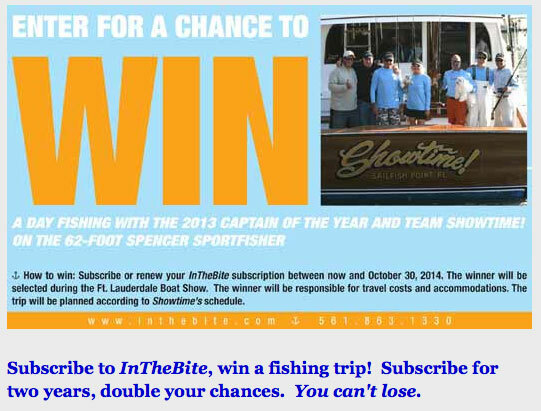 As guides on fishing rods have gotten smaller and smaller the past few years, many fishermen are finding that small is good but “teeny” is more trouble than it’s worth. Lighter weight components add huge benefits to sensitivity and flex recovery but super small guides create their own set of problems with knots, ice and even trash in the guides. The obvious solution in this never ending quest is a lighter thinner ring that offers a larger opening in a smaller, lighter frame. Enter Fuji, the world’s leading rod component problem solver. Together with a team of world class ceramic engineers, Fuji has developed TORZITE®, a super-tough, super-smooth “futuristic” ceramic that has been created for one application alone – guide rings. TORZITE® is lighter, tougher and more resilient than SiC (Silicon Carbide), long considered the gold standard in ring material. It’s smoother as well, accepting 4 times the “polish” of SiC while at the same time being sufficiently hard to withstand the sawing effect of braided lines with no grooving. But it’s what Fuji has done with this amazing material that rocks the boat. Instead of simply offering it as a new optional ring material, Fuji went back to the drawing board and redesigned the crossectional shape of the ring to be thinner and offer a more forgiving “flow surface” for line. The design provides a ring that is tough as nails and at the same time offers a larger inside ring diameter than any other ring materials currently available. Translation: The inside diameter of a TORZITE® ring is roughly equal to the next larger size in other ring materials. In other words, if you have drawn a line in the sand at a size 5 as your choice for the smallest guide you’re comfortable with, you can drop to a size 4.5 TORZITE and maintain the same inside diameter you had with the size 5 in another material. It might not sound like much – until you realize that you have reduced the weight of the guide train by as much as 20-30%! The weight savings manifest as more sensitivity, speed, power and recovery in any rod carrying TORZITE® guides. So what does it all mean in on-the-water terms? For the first time in history, rod companies and custom builders can choose a high-modulus graphite blank, couple it with Titanium TORZITE® Guides, split reel seats and split grips, minimize wraps and “bling” and produce a finished 7 foot medium action rod that weighs just a whisker over 3 ounces! Welcome to the future. TORZITE’s unique new ring cross section provides a ”cushion” of contact that reduces abrasion to near zero. This additional contact causes less abrasion but creates no additional drag thanks to the high polish of TORZITE®. 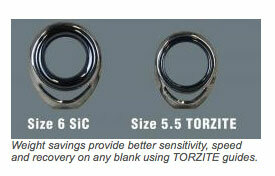 The TORZITE® finish is 5 times less abrasive than SiC! SiC features a profile that is superior to the competition but offers slightly less ”cushion” than TORZITE®. 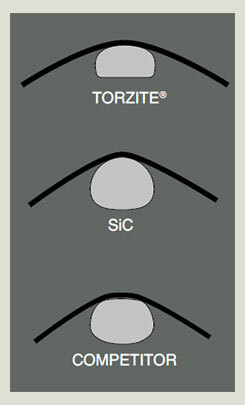 In ”sawing” style abrasion tests, SiC lasted for 764 strokes while TORZITE® lasted more than 3100 strokes!